If you’re looking for a criminal justice career that will put you on the frontlines of protecting America’s security, becoming a border patrol agent could be the perfect match. The U.S. Customs and Border Protection (CBP) is the largest law enforcement division within the Department of Homeland Security. Even though its inception was way back in 1924, the CBP has the same primary mission of identifying and preventing illegal entry into the United States. There are currently over 21,000 border patrol agents devoting their work to protecting our nation’s way of life round-the-clock. As threats from terrorist groups, drug trades, and illegal immigration escalate, so does the demand for border patrol agents. The following is a brief job profile to determine whether border patrol is for you. Border patrol agents are given the daunting task of lowering the likelihood that dangerous terrorists and weapons of mass destruction enter America between the more than 300 ports of entry. Agents patrol the border in vehicles, watercrafts, bikes, motorcycles, snowmobiles, and afoot to protect barely discernible lines designating our nation’s land. 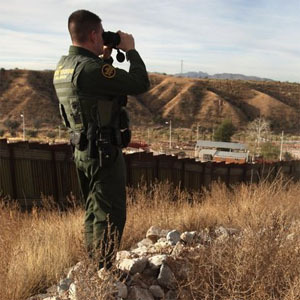 On a typical day, border patrol agents may be responsible for monitoring electronic sensors, conducting surveillance, following tracks or sightings, performing traffic checkpoints, leading anti-smuggling operations, and seizing drugs. When illegal entries are detected, border patrol agents have the power to arrest and detain individuals for enforcing U.S. laws. Border patrol agents are held accountable for patrolling nearly 6,000 miles of international land borders shared with Canada and Mexico. In addition, there are at least 2,000 miles of coastal waters to inspect surrounding Florida and Puerto Rico. Border patrol agents are hired by the federal government and assigned to posts along these borders, usually in tough uninhabited terrain. Certain border patrol agents with the CBP may ensure national security by screening passengers or cargo entering through ports of entry. Border patrol agents who specialize in operational support may work behind the scenes in government offices to conduct intelligence research on security threats too. Due to the weight of responsibility, it’s no surprise that border patrol agents are held to high standards before being hired. Border patrol agents must be U.S. citizens and possess a valid driver’s license. Aspiring agents must be younger than 37 years old when selected. It’s required that border patrol agents possess a four-year bachelor’s degree or substantial law enforcement experience. Having one full year of graduate education in criminal justice could qualify agents for the GL-7 level. Applicants must pass the CBP Border Patrol entrance exam, which covers logical reasoning, the Spanish language, and job-related skills. Border patrol agents must also pass a urine drug test, polygraph test, and background check for security clearance. Overall, border patrol agents serve as the boots on the ground in America’s battle for defending her borders from terrorists, foreign criminals, and illegal aliens. Regardless of the weather conditions, border patrol agents work 24/7 on their assignments to ensure the control of our country’s land and water borders. Although spending 13 weeks in intensive training at the Border Patrol Academy and passing a strict probation period is required, becoming a border patrol agent will be rewarding for law enforcement professionals seeking to keep United States citizens secure.